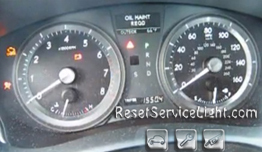 How to reset oil service light Lexus ES 350. From year: 2007. Changing the engine oil Lexus ES 350. Use the trip meter switch to bring up the trip meter A reading. Picture below. Turn the ignition off. While pressing the trip meter reset button, set the engine switch to run (one position before starting engine) and continue to press and hold the knob until the trip meter displays “000000″. Picture below. All information is taken from the Lexus ES 350 owners manual. Full procedure how to reset oil service light Lexus ES 350. From years: 2008, 2009, 2010, 2011, 2012. Turn the ignition to run, push START/STOP button twice (thank to David Mataban). Use the trip meter switch to bring up the trip meter A reading. Turn the ignition off. While pressing the trip meter reset button, set the engine switch to run (push START/ STOP button once) and continue to press and hold the knob until the trip meter displays “000000″. That it is the full procedure how to reset oil service light Lexus ES 350. If you like to reset any maintenance oil light after an oil change. Or reset check engine light, airbag light, inspection key or insp errors when maint reqd, for Lexus cars. Or any warning light for service reminder which appears on the display. Write in the search box the car name for which you want to find information, and find how to reset other service reminders when by yourself. Please note that the run position is two presses on “stop/start” switch and not once as you have instructed. Hello David, thank you very much for the correction. You’re right to reset the oil life on a Lexus ES 350, at first step, when you most switch the ignition to run press START/STOP button twice.With your help we could correct this error. Thanks again. I had my car scanned by auto zone . The check engine light and traction control is coming on.there was two codes that come up .First code U0100said it lost communication with the transmission control Module. The second code U0101said no communication with trams. For U0100 Lexus error code can be ECM circuit poor electrical connection or resistance located to the right of the steering wheel. For U0101 Lexus error codes TCM circuit poor electrical connection. I have same problem with U0101 and u 0100 codes with both check engine and traction control lights on. Which do I try first ECM or TCM ? can a camry tcm work on a 2010 lexus es350 ?